Thank you for your interest in CSAM: THE Safety Conference, proudly recognized as Canada's premier construction safety conference. This two-day conference is designed to equip workers with the knowledge, tools and skills needed to enhance leadership/ management skills, build on existing skillsets and celebrate the importance of safety in the workplace. Your role as an Exhibitor will be to connect with over 1,800 participants and demonstrate your leadership in the promotion of safety and health in your industry. Represent your side of the industry by being a part of CSAM: THE Safety Conference. 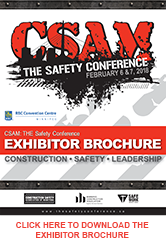 Fill out the form below to register as an Exhibitor at CSAM: THE Safety Conference. For more information, contact us at conference@constructionsafety.ca or 204-775-3171. Your Exhibitor's booth includes two exhibitor passes for your staff (additional passes are available for purchase); a table, chairs and draping; free WiFi; complimentary breakfast and catered lunch; and an entry for a prize draw. Video taken at the 2017 CSAM: THE Safety Conference Exhibitor Area, located on the third floor of the RBC Convention Centre Winnipeg.